Have you ever wondered what it would be like to go to school in a one room schoolhouse? Well here is your opportunity to do so. A hundred years ago in Nova Scotia many of our schools were just like this one with many different age students taut in the same class. Can you imagine having grade 1 through to grade 10 students, all in the same room? Better yet, with very little paper to write on. 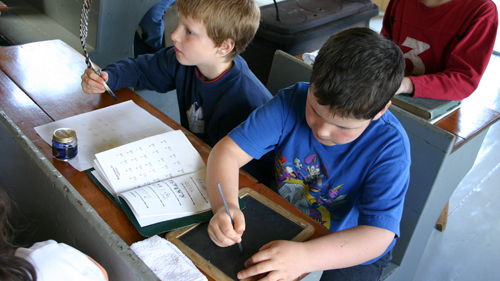 What did these children use, slate and slates pencils; which are a type of rock. They also used quill pens made from goose feathers. Wouldn’t it be neat to attend a class like this one, to step back in time? The interpreter acting as a school marm or teacher, as we know of he/she today, will explain just how school would have been in those days. In this hands-on group, each student will receive a lesson booklet with exercises. Children are able to use slates and quill pens, as well. Students may even have to carry firewood into the school, which is used for heat in this little one room schoolhouse.